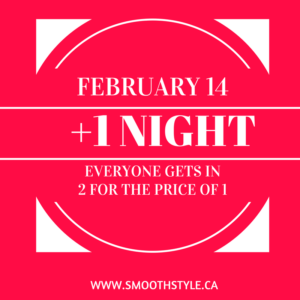 Home » Events » February 14 is Plus-One Night! February 14 is Plus-One Night! You don’t have to be “in a relationship” to get a Valentine’s Day deal! This year, February 14 falls on a Tuesday, so we’re offering 2-for-1 entry to EVERYONE at Ottawa’s Weekly West Coast Swing event. Bring a friend, stranger, or lover. Coming alone? That’s OK – grab someone at the door and share the price with them.